The Sustainable Flatbush SunBike, launched Summer Solstice 2011, is a mobile solar-electric system on a retrofitted cargo bike. It’s designed to meet all kinds of “street power” needs, from outdoor film screenings and dance parties, to greenmarkets and street vendors, to community garden workdays and cafes. 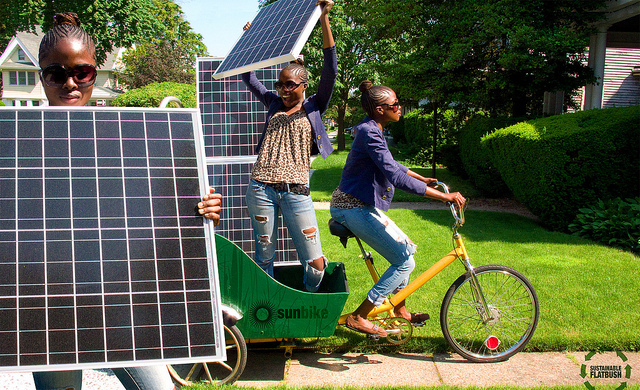 The SunBike shows that renewable, clean energy can be a reality right now. One of the most important aspects of the SunBike is its capacity to log all power and energy data, because, as Lord Kelvin said, “If you cannot measure it, you cannot improve it.” In other words, the “data acquisition system” turns a novelty into a powerful tool for learning. With a compass, built-in protractor, temperature and sunlight sensors, and appealing analog meters, the SunBike invites all who come into contact with it to crank, turn, and tap. Imagining the SunBike. Drawing by Curt Meissner. Since its launch in the summer of 2011, the SunBike has demonstrated the power of the sun at the Cortelyou Road Greenmarket, Maker Faire the Church Avenue Communal Garden, and other venues throughout our neighborhood. 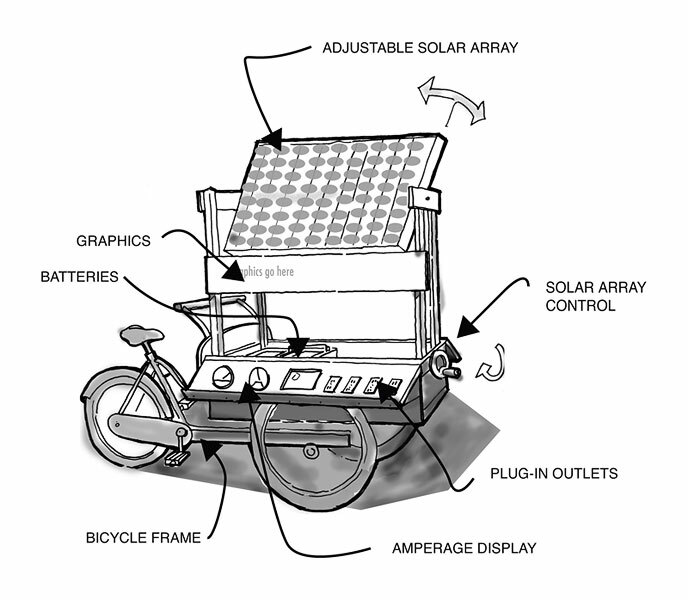 The SunBike is available to schools, businesses, youth programs, event producers, and food vendors. To discuss partnering with us to demonstrate the possibilities of clean power, or find out more about the Solar Team, contact SF Energy Solutions Project Manager Jocelyn Cohen, or call SF at (718) 208-0570.